April 17, 2017, 10:31 AM · The music of Eugène Ysaÿe has always been one of my great loves. The aspect of his music that I find most appealing as both a listener and a violinist is the tension that results from the intermingling of the romanticism of his youth and the modernity of his adult years. From a technical standpoint, Ysaÿe’s knowledge of the violin’s capabilities is absolutely unparalleled, which makes learning and performing his music a pleasure. During my years in school, I tried to play as much music by him as I could, working my way through the famous Solo Sonatas and some of his better known works with piano. 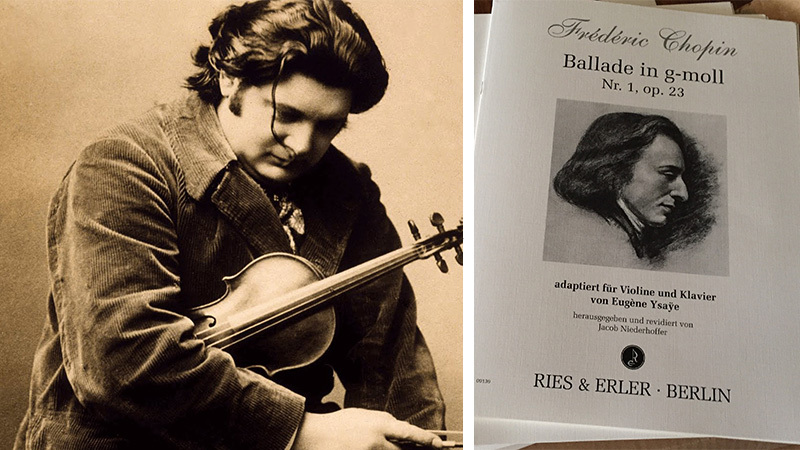 Eugene Ysaye, and the transcription of his violin version of Chopin's Ballade No. 1 op. 23. After reading further about his life, I realized there is a tremendous amount of his compositional output that has gone unnoticed or been forgotten. Two piano trios, eight violin concertos, various works for string orchestra, and a generous handful of showpieces with orchestra for a number of different solo instruments, for starters. Looking through these little known pieces, I knew that I wanted to become better acquainted with these works. I quickly discovered that that would be easier said than done, as many of these works are out of print, hard to find, or were never published at all. I saw the transcription of Chopin’s Ballade No. 1 op. 23 on lists of works in biographies and immediately became intrigued. I searched for the sheet music, unsuccessfully, and instead discovered a facsimile of the messy draft manuscript (which had been sitting in the Library of Congress for years) and a beautiful recording by Philippe Graffin. From there, I decided to make my own edition to perform from, so I figured out how to use music notation software and went about creating a usable copy of the score and part. I sought to create as faithful a representation of Ysaÿe’s intentions as possible, keeping as many of his suggestions as I could. Wherever the musical intent was left unclear, I referred back to Chopin’s original work and placed suggestions in parentheses for the performers. Ysaÿe created this transcription in 1916 while in London, during a period of decreased compositional productivity, between his Sonata for two violins and the symphonic poem Exil, for reduced string orchestra. It was 16 years after his much better-known transcription of the Caprice d’après l’Étude en forme de Valse by Saint-Saëns, and seven years before his monumental Solo Sonatas. This transcription displays some trademarks of Ysaÿe’s writing: many unique and ingenious solutions to technical problems, a sensitive ear for color and harmonic shadings, charming melodies requiring a strong sense of phrasing and rubato, and virtuosic passagework and double-stopping in equal measure. For me, one of the most rewarding consequences of working on this project and learning the piece was hearing how seamlessly Ysaÿe's musical language seems to meld with Chopin's -- while the music is Chopin's, Ysaÿe's unmistakable voice shines through in his use of distinctive fingerings, open strings, and the violin's different registers. Ysaÿe’s vision of Chopin’s First Ballade is a hidden gem of the violin repertoire, and I hope it becomes much more widely known and played. Here is a link to the transcription, available through Ries & Erler's website, and here through Carl Fischer's website . Though there is no recording of Ysaÿe's violin transcription online, here is the original Chopin piano piece, played by Krystian Zimerman. Enjoy! April 18, 2017 at 09:30 PM · I didn't expect to enjoy that as much as I did. April 18, 2017 at 10:15 PM · It's such a beautiful piece. April 20, 2017 at 01:13 AM · Dear Jacob, your understanding of ysaye is touching, and this print is a major event that we must celebrate!I do want to ask you though, or any other friends here-does anyone know where to access the valse schertzo by Chabrier that Ysaye recorded. What did that transcription? This is a jem, that Arthur Rubisntein performed as an encore for decades, he recorded it as well.